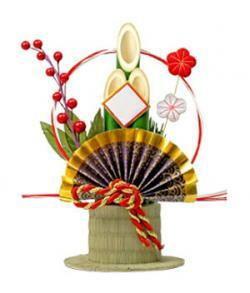 Decorations for the Japanese New Year are steeped in traditions that continue to be passed down from one generation to the next. Until 1873, the Japanese based their New Year's Day on the Chinese lunar calendar notes China, Japan, Korea: Culture and Customs. After the Meiji Restoration, the Chinese lunar calendar was replaced by the Gregorian calendar. New Year's Day in Japan is now celebrated on the same day as many other areas of the world -- January 1. The history of the decorations for this day revolves around a variety of traditional items. Most Japanese usher in the New Year with a three-day festival that involves a variety of activities. Before the celebration can truly begin, an intensive house-cleaning must take place. This cleaning is part of the welcoming of the New Year in which the Japanese focus on the importance of bringing hygiene into their homes. Once a house has been cleaned, it is now considered ready to be decorated. Considered one of the best known, traditional New Year's decorations, the Japanese kadomatsu refers to the "gate pine." Believed to welcome the ancestral spirits of the harvest, kadomatsu is placed in front of Japanese homes from Christmas until January 7. Gate pine can be created from a variety of materials, including bamboo, pine and ume tree sprigs, each of which symbolizes longevity, loyalty and prosperity. Typically, the center of the kadomatsu is created out of three large bamboo shoots, arranged in different heights. The Japan Times states that each shoot symbolizes longevity, prosperity, and steadfastness, in that order. The shoots are tied with straw mats and newly woven straw rope, and they can also be decorated with additional embellishments such as flowers, lights and stars. The pine, as an evergreen, symbolizes constancy, while the bamboo, which can be bent without breaking, symbolizes resilience. Created from willow branches and pink and white mochi wrappers, mochibana continues to be a popular Japanese New Year's decoration. 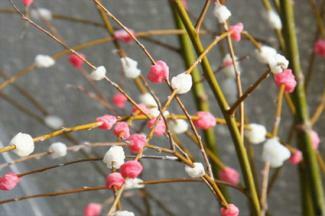 It symbolizes the coming of spring in Japan. Kyoto Foodie says mochibana originates from the northern part of Japan. This area is "snow country" so flowers do not grow there naturally. Instead, residents in this area would make their own mochibana so they too could have flowers in their home during the New Year to celebrate the coming of a new spring season. The translation for kagami mochi is "mirror mochi rice cake." The decoration consists of two round mocha. One mochi is smaller than the other. The smaller of the two mochi is placed on top of the larger mochi. A dadai Japanese orange sits on top of the smallest mocha. The orange also has a leaf attached to the top of it. The decoration is placed around the home starting at the end of the year until January 11, which is kagami biraki, when the kagami mochi is opened. The kagami mochi originates from an old fashioned copper mirror, according to The Japan Times. Because kagami mochi is made of rice, the belief is that it contains the spirit of the deity toshigami, which brings a good harvest, blessings to its ancestors and the power of life when the deity visits during the period of New Years. 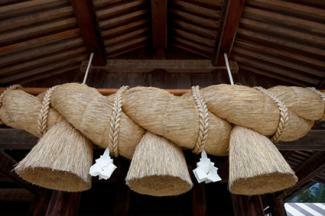 The shimenawa is a rope that is made out of straw. It has white paper strips that dangle from it. Japanese tend to hang the shimenawa over the front door and in other places around the house. 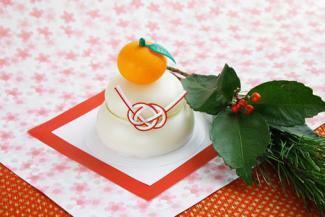 According to the Asia Society, the shimenawa is a symbol of the home of the New Year's god. Today, Japanese homes often feature a mixture of the time-honored decorations from history as well as the more modern decorations often found in the West. However, while many families may choose to incorporate the more commercialized decorations and ornaments of today, they typically continue to embrace the historical practices of their ancestors and hold on to the customs and traditions of their forefathers.